This issue of the IRAAA explores the subtle changes being made by major civic and African American museums as these institutions attempt to build and retain new audiences. Some American museums realize that a change in strategy is necessary to narrow a cultural gap between museums and the black community, a distressing anomaly that has existed for more than a hundred years. Some of the more powerful museums are re-examining their guiding principles. They are now providing an environment for experience that cross cultures while incorporating programs designed to educate, to inform and enhance the complete aesthetic experience. 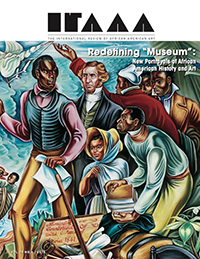 As new black art museums and other cultural attractions continue to develop and grow at an alarming rate, it is clear that many of them are still faced with dwindling staff, reduced operating expenses and acquisition funds that continue to dry up. However, there are many success stories along our Eastern Corridor and this issue focuses on several noteworthy projects where communities, artists and museums have found common ground and a sense of meaning. This issue features guest editor, Lee A. Ransaw and six articles written by, Stephanie Mayer Heydt, David Julian Hodges, Grace Hampton, Glenn McNatt, Lee A. Ransaw and Klare Scarborough.